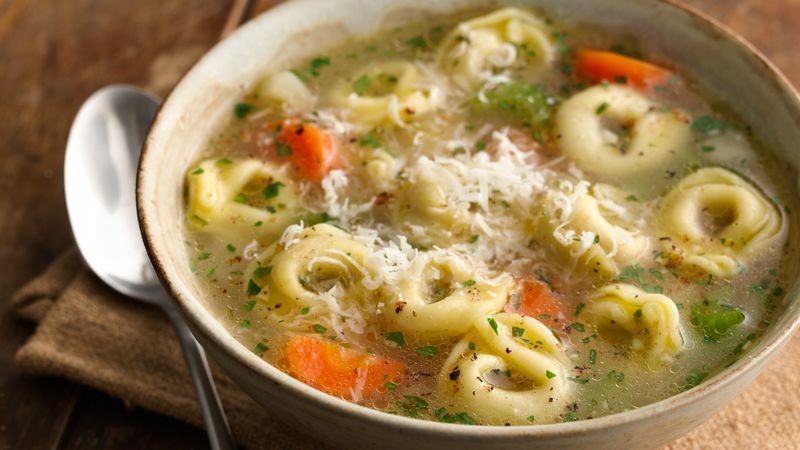 Small stuffed pasta, like tortellini, is just the right size to fit into a soup spoon. Dried tortellini is an easy pantry staple, but you could sub in frozen or fresh tortellini from the refrigerated food department or a pasta shop (fresh cooks up faster). Cheese, spinach, or meat-stuffed—your choice. Look for low-sodium broth, so you can control the level of seasoning in the soup. A flavorful beef or veggie broth can be used instead of chicken. Chop up a mixture of Italian herbs, such as oregano, rosemary and thyme, to stir into the soup before serving. Spoon this into a short thermos to take along for an office lunch. Don’t forget a small container of grated Parmesan to sprinkle on top, along with some crisp bread sticks and a cluster of red grapes. For a pretty color contrast, try using half spinach and half plain tortellini.